Those non-elected, impossible-to-sack bureaucrats who “manage” Europe have lost their wits. While the rest of the world tries to hammer out a global agreement to reduce our emissions and thus “fight” climate change, these thickwits have slapped a 70% anti-dumping tariff on cheap Chinese solar panels. How mad can they get? Regular readers know I oppose any attempt to fight the climate. I say it’s impossible to reverse what hasn’t happened and that we cannot cause and you’re much better off putting money into coping with whatever the climate throws at you. However, if you disagree and decide to invest good public money in the cheapest possible solar panels, then refusing the cheapest solar panels when they do finally arrive proves your insanity. Now I find evidence that the lunatics have escaped their asylum and have taken over the entirety of this lovely and beauteous continent. They’re imposing import tariffs on cheap Chinese solar cells. This at the same time as vast swathes of public policy are devoted to the idea that we’ve got to have cheap renewable power in order to save our entire species from boiling itself. We’re also spending hundreds of billions to make such cheap renewables a reality. So, when someone comes knocking at the door asking if we’d like to purchase some cheap, our answer is to try and tax them for their temerity? This is madness. Pure, unrestricted, no we’re not going to let you out of that straitjacket matey, lunacy. The European Union has applied sharp tariffs on Chinese solar-panel makers Canadian Solar, ReneSola and ET Solar, kicking the companies out of a pact with the Chinese industry that allowed them to export to Europe with minimal tariffs. Just five days ago, European authorities imposed sharp tariffs on three large Chinese solar-panel manufacturers. We’re also spending trillions of euros to try to achieve this goal: Germany is said to have spent a trillion alone. And our goal is that someone will walk in the door and say, I’ve got some cheap solar cells here, would you like some? No, seriously, that is what the goal is. If we can find someone, anywhere, who can make cells cheaply enough that the electricity derived from them costs 6 to 10 cents a kWhr then we’re done. Everything else simply falls into place once we can in fact generate cheap electricity without emissions. So, here’s our man (or three companies) hawking cheap solar cells. And instead of welcoming them in, offering a cup of tea as we haggle over pricing, we’re taxing them to make sure they can’t sell us any of their nice, cheap, solar cells? It would be funny if it weren’t so depressing. The dispute has been running for some time; here’s an account of Angela Merckel in 2013 opposing anti-dumping tariffs; I guess she lost. The Global Scam has always been about investors making fortunes off the gullible masses. The Chinese are not welcome to muscle in on the European turf. That’s hilarious. I guess it just goes to show that they don’t really believe in global warming. Mind you it’s not unexpected, they’re trying to artificially raise the price of carbon credits as well due to the fact the free market values carbon credits on a par with junk bonds. Good point, I hadn’t thought of that. But they’re insane to do it while pretending they want cheap renewables. Britain now has a “once in a lifetime” opportunity to get out of the EU, with the proposed referendum on EU membership. 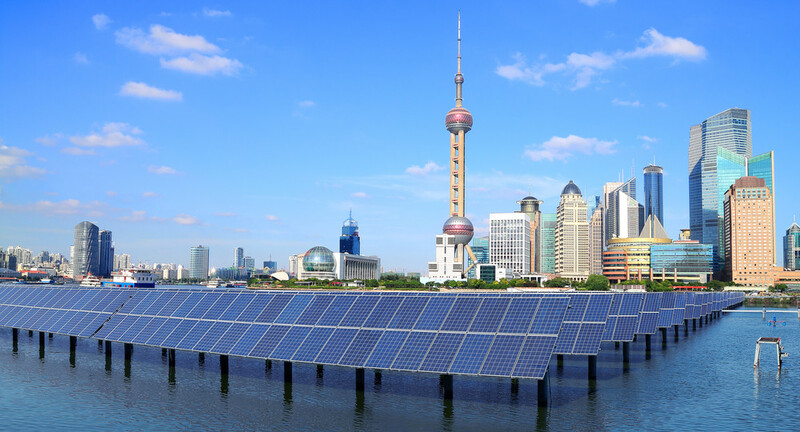 Looking at those panels in Shanghai suggests that there are lots of jobs cleaning solar panels in China. I heard once there’s a law of unintended consequences; I wonder if that applies here? The Law of Unintended Consequences not only exists but has wonderfully sharp teeth and the law has universal application. Living in Auckland (which is temporary, as far as I am concerned) gives us all a living, breathing example of that law, particularly under the apalling Mayor Brown. I am reassured that the good citizens of Wellington woke up in time to realise that the chimera of ‘bigger is better’ is nothing more than a chimera. The current drama vis-a-vis Fonterra is another example of the law of unintended consequences and also that bigger is not always better. the chimera of ‘bigger is better’ is nothing more than a chimera. It may not be better, but it sure is bigger. Of course, short of erecting a stout fence and installing armed guards, the citizens of Wellington can no more prevent people moving to Wellington to live than can the citizens of Auckland. I mean to say that a town’s expansion is not decreed, or Twizel and countless others like it would not have faded away. As you may have guessed, I love words and their power to transmit ideas, information and humour. I worked with a bloke once who owned a lovely playfarm which he named ‘Shibboleth’ – I used to smile every time I drove onto his property and past the carved wooden nameplate on the gate. The farm, once remote from the city of Auckland, is now surrounded by suburbia. On a more climate-related note, I cringe every time the government’s wildly-uninformed ‘Science Advisor’ displays his very considerable ignorance on television and my wife tells me that shouting at the telvision set is absolutely unproductive. I have yet to discern the mechanism which connects any form of tax with the temperature of this planet, but as a mere layman I guess I must defer to impressive letters after ‘expert’ names. But, as the sudden arrests of top blokes in FIFA demonstrates, people such as I who are unconnected with the levers of power, are not in a position to know what is actually happening in the top echelons. But one keeps trying to part the curtain, for ourselves as much as anyone.